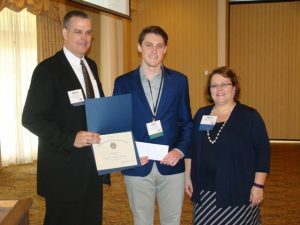 Innovative Engineering, Inc. (IEI) is pleased to announce that Sam Watts, a structural engineering intern at IEI in Atlanta, has won the 2015 – 2016 Al Rowe and Sy Liebmann Scholarship sponsored by the Atlanta Post Society of American Military Engineers (SAME). The honor from SAME recognizes students with serious scholastic aptitude, good character, leadership qualities, and well-rounded personal development, who are pursuing a college education in engineering, architecture, science, and related degrees. Presentation of the scholarship award was given during the July 14, 2015 meeting held at the Dunwoody Country Club in Atlanta, Georgia. The scholarship was presented by SAME Atlanta Post President, Beth Harris and Executive Director, Steve Poole. The purpose of the scholarship is to encourage and assist qualified students who are pursuing a college education in engineering, architecture, science, or math, and related degrees so that they, in turn, might further the goals and exemplify the ideals of SAME. Watts joined IEI as a structural engineering intern in May 2014 while earning his bachelor’s degree in civil/structural engineering and is currently pursuing his master’s degree from the Georgia Institute of Technology. As an entry-level engineer, he manages and participates in the preparation of structural engineering calculations, contract documents, specifications, sketches or CAD drawings, and site visits.